(Bloomberg Opinion) -- The key to crafting international agreements is making sure that all parties are able to declare victory. That seems to be at the heart of the emerging trade pact between the U.S. and China. Beijing would have until 2025 to meet commitments on commodity purchases and would allow American companies to wholly own Chinese businesses, three people familiar with the talks told Bloomberg News. China will have target dates 90 days and 180 days into the future to follow through on some of its pledges, and failing to come good on its 100 percent foreign-ownership promises would trigger retaliation, the people said. Other commitments wouldn’t have to be implemented until 2029 and wouldn’t result in punitive measures, while issues around technology transfer remain a sticking point, according to the report. It’s not hard to see how this would be sold as a victory in the U.S. – but it’s worth remembering that China, too, will be able to present such an agreement as a seal of approval on its existing policies. For instance, the drive to allow 100 percent foreign investment in local businesses has been a long-standing one. 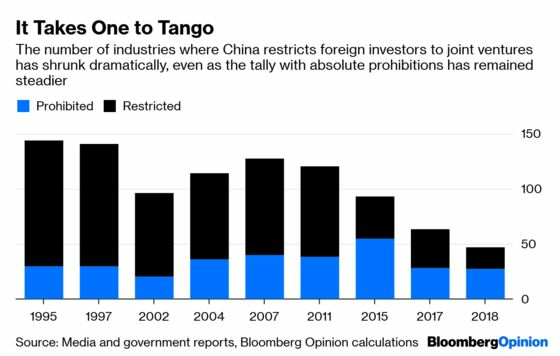 China’s foreign-investment catalog – a document defining the sectors of the economy in which foreign partners are encouraged, or banned, or allowed in with restrictions – has been progressively pruned ever since the first edition was released in 1995. The restricted category mainly consists of industries where overseas companies can only operate in joint ventures with local partners as controlling or minority shareholders. This seems to be the area being targeted by the proposed foreign-ownership commitments – but with the progressive removal of financial-services businesses and auto manufacturing from that list, just 20 industries remain. Indeed, the fact that technology transfer is still seen as a stumbling block despite the proposed foreign-ownership changes is a sign of the pact’s limits. Historically, such vesting has happened via foreign companies putting their intellectual property into these mandated joint ventures. But if the JVs are going away and the forced transfers remain, that suggests Beijing isn’t offering to budge on less prominent routes for IP leakage, such as licensing. As we’ve argued, a deal focused on purchases of commodities such as chicken, soybeans, crude oil and LNG isn’t likely to leave the U.S. in a better position than when this process started. Long before President Donald Trump came to power, China has been talking about rebalancing toward a more consumption-based economy. Indeed, the biggest factor in closing the U.S. trade deficit with China is probably already in place. The budget request released last month by the White House, if enacted, would cut regular non-defense discretionary spending by 9 percent next year. That matters, because lower budget deficits ought to decrease U.S. interest rates and foreigners’ demand for U.S. assets, which in turn pushes down the value of the dollar; makes foreign goods costlier to U.S. consumers; and narrows the trade deficit. 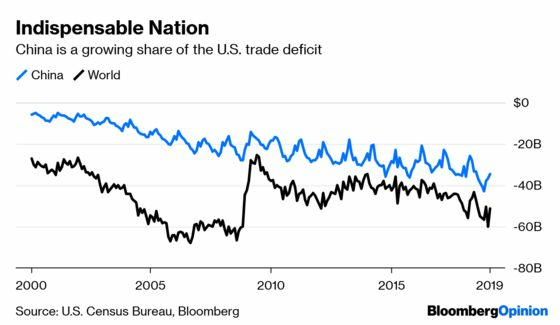 Combined with the Federal Reserve’s shift from interest-rate rises, trade deficits should start to shrink on their own accord, regardless of Chinese commitments on commodity purchases. Should such an agreement be struck, Washington will be able to argue that the threat of trade war gave Beijing a nudge toward opening up its economy and closing up the goods deficit, which still, erroneously, dominates U.S. discussion around trade fairness. Beijing, for its part, will argue that changes were long envisaged by its policymakers anyway as China’s economy changed, incomes rose and U.S. food producers cleaned up their act. Each spin on the pact will be equally plausible – which is probably a positive sign that a deal could be reached. In a contest where both sides want to be seen coming out on top, a limited agreement seems the most fruitful way to reconcile mutually incompatible aims. There's a separate list where foreign investment is banned altogether. Allowing U.S. companies into those industries would be a much more significant victory, but it's hard to imagine China allowing wholly foreign-owned companies to operate in fields such as news and media, air-traffic control, and schooling where state control is considered a vital national interest.